Renting with a pet can have its challenges no matter where you live, but finding the right community can be incredibly rewarding. 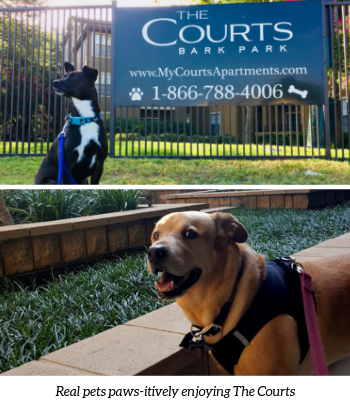 The Courts at Preston Oaks Apartment Homes knows your four-footed companions are happiest right by your side and that’s why we allow up to two pets per household. The Courts has plenty of green space including a convenient off-leash dog park. Our community is also purr-fectly surrounded by walking and running trails and is minutes from Celestial Park, which offers beautiful scenery and plenty of recreational space for you and your animals to enjoy. Here at The Courts, our community loves pets, nonetheless we ask that our furry friends are kept on a leash at all times when not at the dog park. We take pride in our property and are delighted to know our residents clean up after their pets. We encourage all pet owners to carry a supply of bags and use the provided stations to dispose of waste.